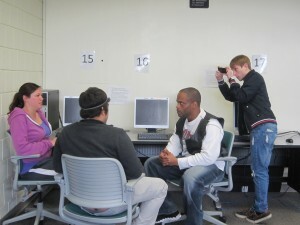 Students in Business Communications created PowerPoint presentations for local non-profits. Engineering and Computer Science students taught elementary school students basic engineering skills to build and control robots. Sociology and Spanish Language students helped organize a multi-cultural community event for over 400 people. Math students tutored elementary school students throughout Berkshire County in math during the school day and in after school programs. Psychology students assisted individuals in gaining life skills in outreach programs at the Brien Center. Environmental Science students performed trail maintenance the BCC’s John Lambert Nature Trail for the college and community to enjoy. Criminal Justice students volunteered to mentor teens at at-risk youth programs. Spanish students created and taught a Spanish After-School program to 4th and 5th graders which culminated with a performance at the schools’ end of the year showcase event.